It's been two weeks since my last post - now how did that happen? I could list some recent distractions, things like house guests, Happy Hours, walks in the park, online classes, etc. The truth is that I've filled my time with things other than inspired cooking or photography. That's life - busy, fun and frequently spontaneous. I can relate to a John Lennon quote, "Life is what happens to you while you're busy making other plans." Most recently an online CreativeLive Lightroom Workshop has kept me tethered to the computer, challenging my brain with all manner of things photographic. For three days, from 9 a.m. till 4 p .m., I have focused intently on images, keystrokes and commands, shortcuts, process and workflow... until my stomach growled, grumbled and finally roared, sending me to the kitchen to grab a quick snack. It's amazing how often you can graze and nibble without actually cooking anything. I finally turned to the refrigerator and freezer, hoping to find something easy, already prepared, ready to reheat or even defrost. Instead I spied a chunk of fresh pork tenderloin, a frozen tub of already-roasted tomatillos, a bunch of cilantro, several green onions and a partial carton of sour cream. Not a bad start, these ingredients were familiar basics, almost all I needed for a simplified version of Tomatillo-Braised Pork Loin, a favorite Rick Bayless' recipe. 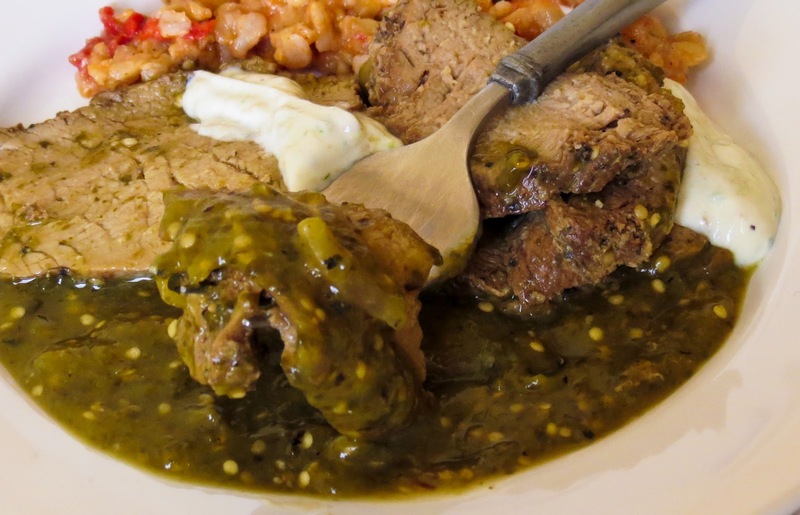 (link) I worried briefly that the tomatillo sauce would be flat without the usual roasted poblanos, but that proved to be a non-issue. Adding a dollop of tomatillo sauce sour cream to the dish was a tasty finishing touch, a substitute perhaps for those missing peppers. There's something about March that leads me to tangy or spicy pork dishes In 2010 it was Chili Verde, in 2011 it was Pork with Poblano Peppers, and now here's Tangy Tomatillo Pork. Is it Mexican March Madness? No, I think it's more like a lot of good Mexican-influenced cooking year 'round. 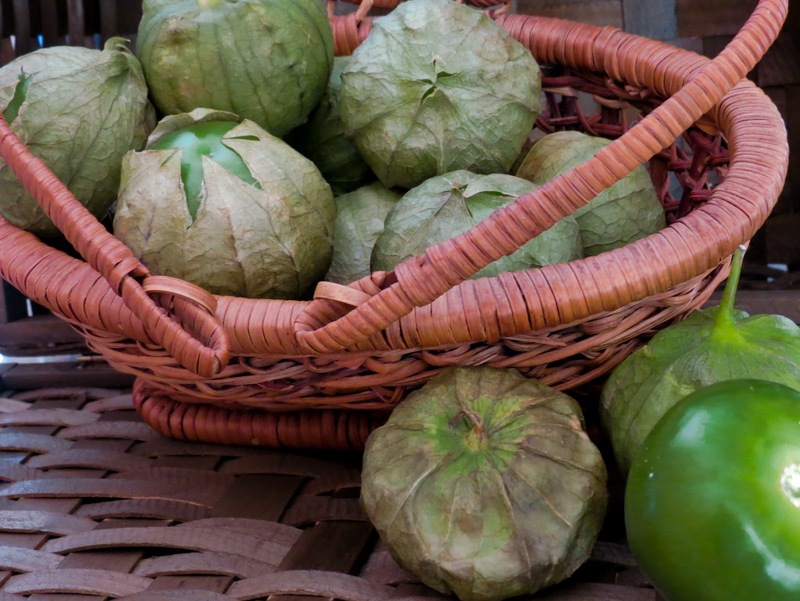 Line a baking sheet with foil and place the husked and cleaned tomatillos on it stem side up. Broil the tomatillos until blistered on top; turn over and broil to blister the rounded bottoms. 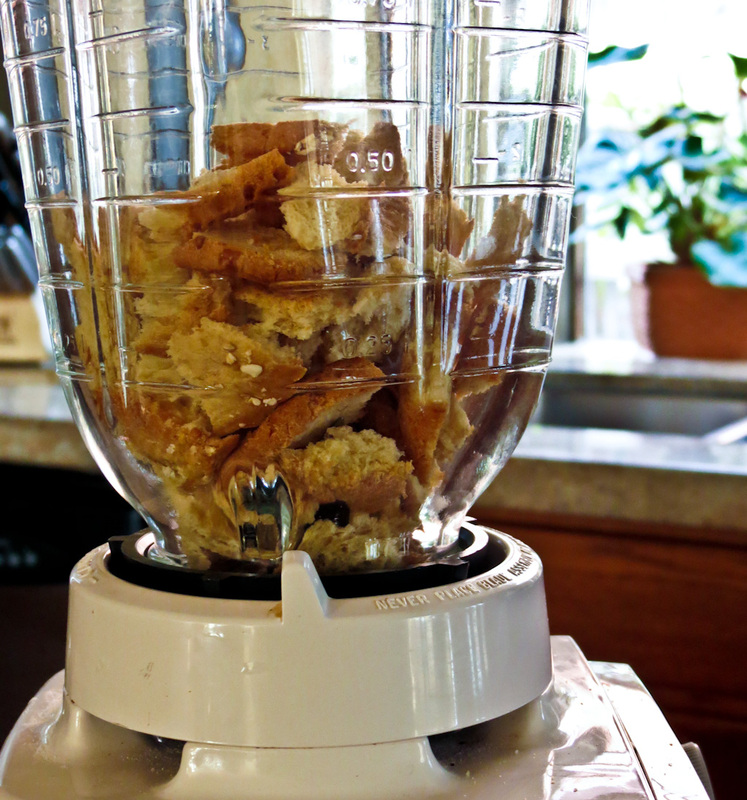 Transfer the tomatillos and any juices to a blender. Add the cilantro, stems and leaves, to the blender and whiz until thoroughly pureed. ( Or use an immersion stick blender.) Set aside 2 to 3 tablespoons to mix with sour cream for a topping. Dry the meat and season well with salt and pepper. Heat a tablespoon of oil in a small sauté pan over medium-high heat. Sear the pork until browned on all sides, but don't cook it through. 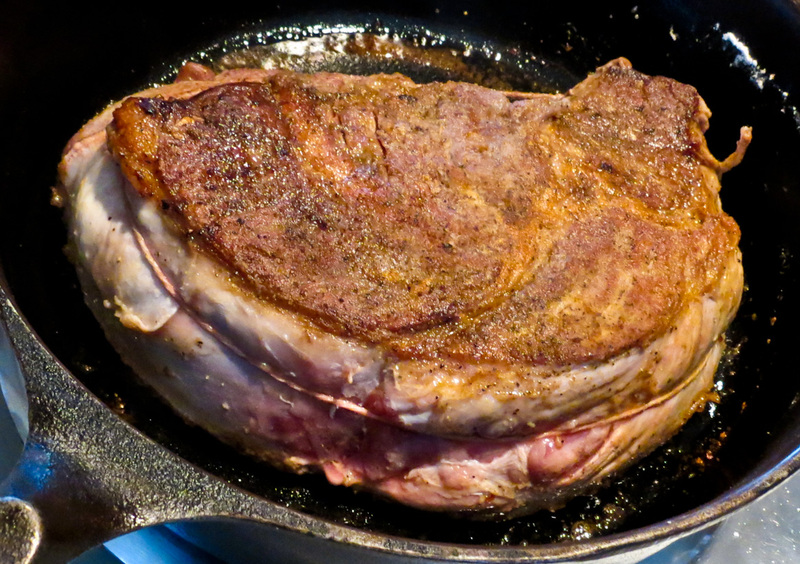 Remove the pork from the pan and set aside. Add the onions and garlic (if using) to the pan and cook until fragrant. Add the tomatillo cilantro mixture to the pan and cook over medium-high heat, stirring constantly, until darkened and thickened slightly. Place the meat in the pan, turning to coat with the sauce, and reduce the heat so the sauce is barely bubbling. Cover and cook at a low simmer for 15 minutes. Turn over and continue cooking covered for another 15 minutes, or until the meat reaches 145 F or barely pink inside. Add chicken broth as needed/if needed to thin the sauce and keep it from scorching while the pork cooks. Rest the meat for a few minutes, then slice and serve over a puddle of sauce. Top with a dollop of tomatillo-sauced sour cream. 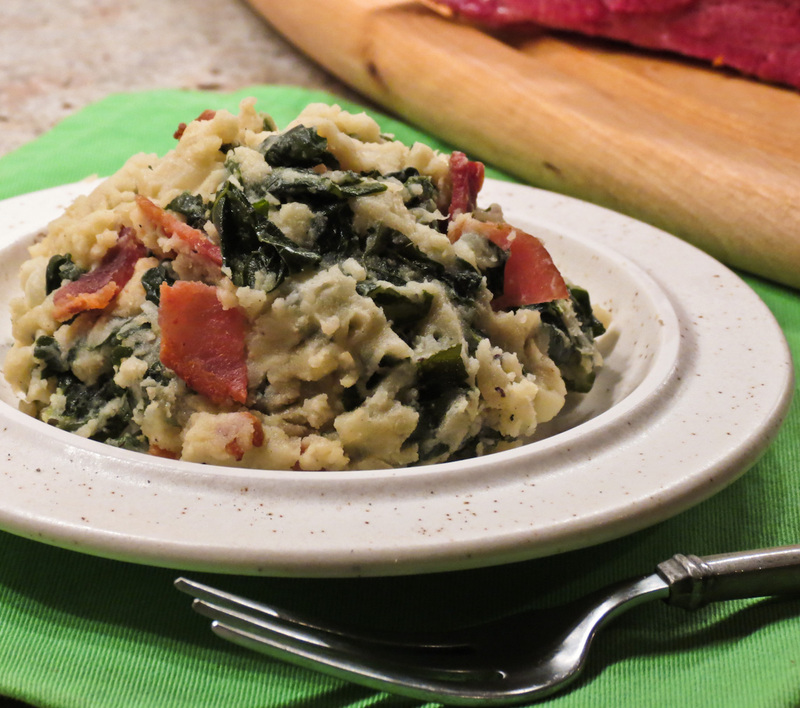 Colcannon is a favorite dish on any day. It's not just a St. Patrick's Day special, though it is a perfect choice to accompany a piece of corned beef and a pile of orange and honey sauced carrots. With a dish this tasty, why would you ignore it the rest of the year? Well, we don't. Many traditional colcannon recipes call for creamy mashed potatoes mixed with shreds of cooked cabbage, a few scallions, heavy cream and a lot of melted butter. Oh yes, a whole lot of butter. 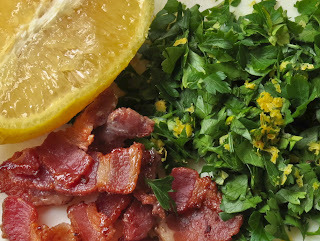 A few recipes call for crumbled bacon, most have no bacon at all. I found one over-the-top recipe that suggested serving a colcannon volcano, complete with a depression on top to hold a pool of melted butter. That same recipe also called for rashers of crisp bacon stacked vertically around the volcano's outside edge. Could you argue that the shreds of green cabbage made this a healthy dish? Mmmmm, maybe not healthy, but it must be an amazing sight at the table. My current version is tasty, quick and easy to prepare, but clearly not an Irish classic . 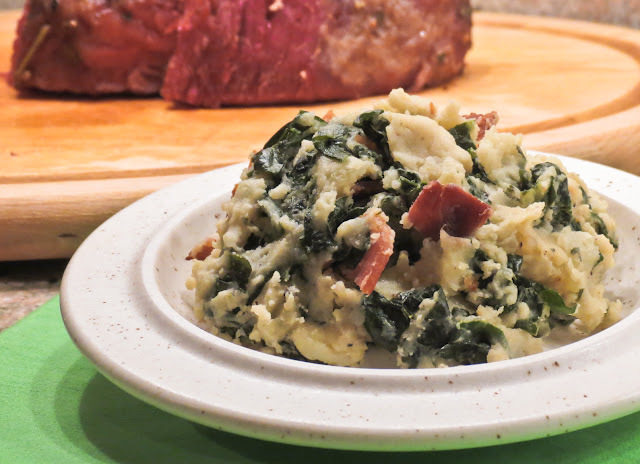 No matter, we love this colcannon made with kale and a bit of butter... bacon optional. 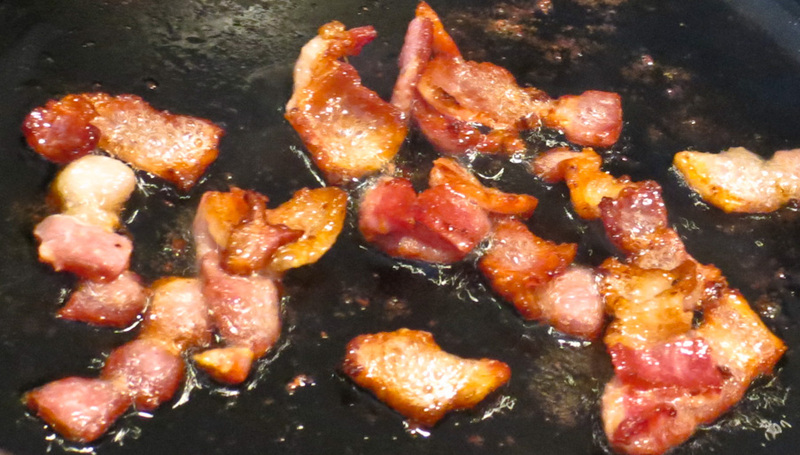 If you're using bacon, cook it till crisp and set aside. Use the microwave or do this on the stovetop. Use the microwave to nuke the whole potatoes; set aside and keep warm while you cook the kale. Melt a generous tablespoon of butter and a bit of olive oil over medium heat in a heavy bottomed pot. Add the shredded kale a handful at a time until it wilts, and then add the chopped green onions. Stir in the broth and milk and bring to a simmer and reduce the heat to low. Add the remaining butter to the pot. Slice the cooked potatoes lengthwise; use a fork, to shred the insides into the kale mixture. Mix together with the fork and roughly smash into the desired consistency (I like mine rustic rather than smooth and creamy). Season with salt and pepper to taste. Top with the crumbled bacon if using, or stir it in. Consider minced parsley as another topping option. - On the boat I use the microwave for the entire dish rather than the stovetop. It adapts easily and the results are similar - delicious! - Leftovers reheat well in the microwave, or even as potato patties on the stovetop. - Thinned with more chicken broth, any leftover colcannon turns into a tasty potato soup. If you need to stretch it a bit, add some instant potatoes to the soup (I won't tell). 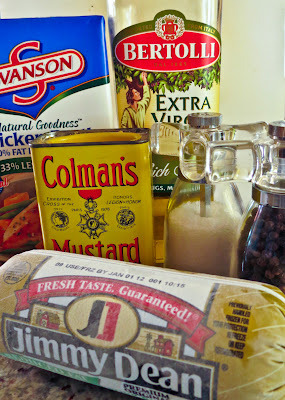 - Skip the bacon, substitute vegetable broth, and the recipe works on an Almost Meatless Monday menu. Daring Cooks: Braving the Braise! Not that Ruhlman is the only cookbook author to focus on this topic. (link) (link) My own copy of Molly Stevens' Braising: the Art of Uncomplicated Cooking is dog eared and splattered from use, and I have scads of other cookbooks with whole chapters that highlight braising. (link) (link) I'm still waiting for several more cookbooks to become available from my Reserve List at the local library. How is it that braising has become the latest new/old thing? 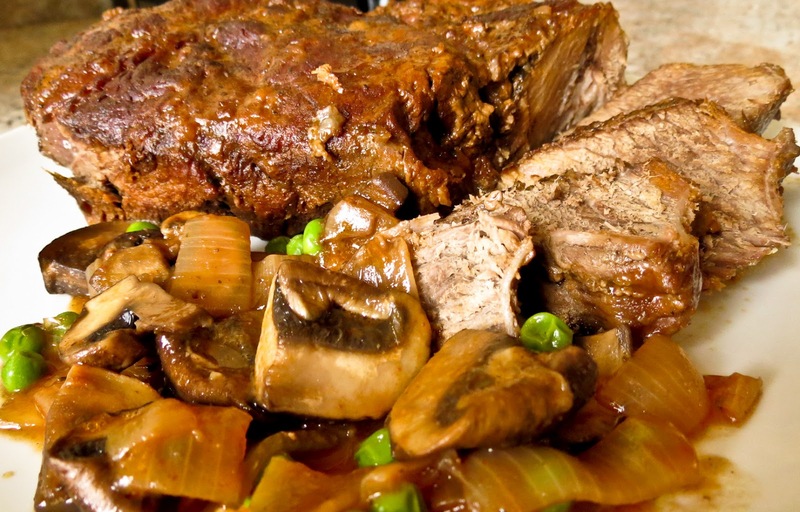 Braising is nearly universal, an ancient cooking technique reputed to be over 300,000 years old and widespread across many cultures. Here in North America generations of Moms have called it pot-roasting or slow or one-pot cooking and used this method to coax maximum flavor and tenderness out of otherwise tough cuts of meat. 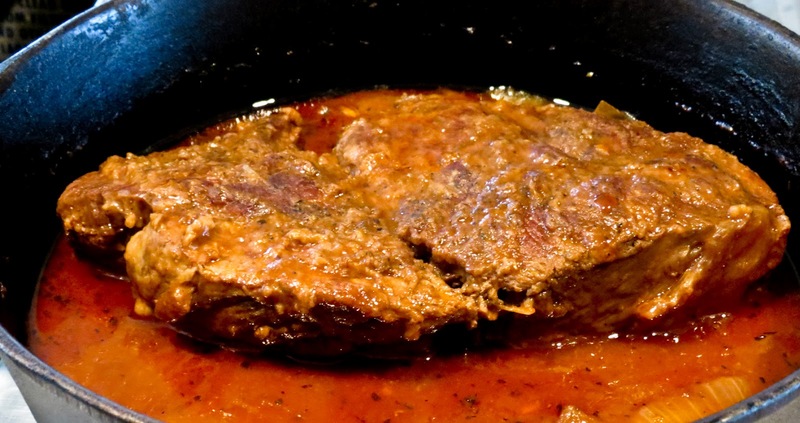 Braising is a two-step process. Initially meat is seared on all sides to produce a browned crust that holds in the flavor of the meat and creates pan juices and fond to flavor the sauce. Step two adds seasonings and a bit of liquid (usually acidic) to steam the meat in a covered pot at a low temperature in order to break down the tough fibers. There is magic hidden somewhere in that brief description, or so it seems when you enjoy a well-prepared braised dish. Just imagine a forkful of tender, juicy, beef glistening under a coating of flavorful sauce... mmmmmmmm, good! and so far removed from any lingering memory of the occasional overcooked, tasteless, shoe-leatherlike pot roasts in my past. (Nope, I won't name any names.) Braising is all about slow cooking at a low temperature, the main ingredient's flavor enhanced by well-chosen aromatics and additives. 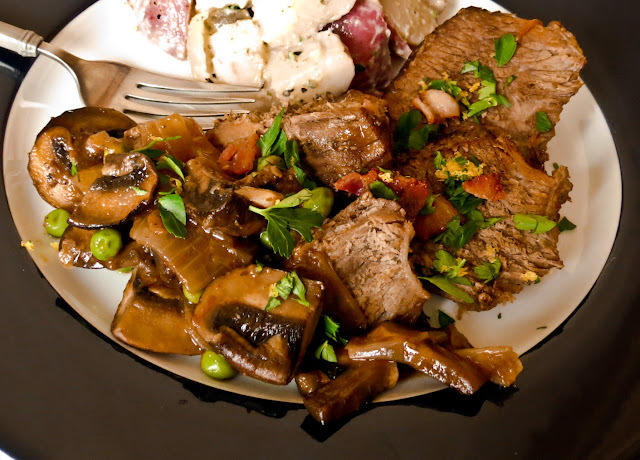 We love, really LOVE the smooth, rich sauce of a traditional Boeuf Bourguignon. That sauce is scrumptious, tasty enough to eat with a spoon and tempt me to ignore the chunks of meat that go with it. If the bourguignon preparation works for beef cubes, why not for a larger cut of meat like a roast? With the cooking time adjusted and the meat simmered with considerably less liquid, that roast was a winner. The sauce was still good enough to eat with a spoon: so I did. Later on I indulged in a sauce-topped bowl of noodles for a late-evening snack. RL demonstrated mannerly restraint, and used knife and fork to enjoy a hot beef sandwich from his share of the braised leftovers. Heat the Canola oil in a heavy Dutch oven over medium heat: fry the bacon until crisp and then set aside for use as a garnish when serving. Sear the onion slices until translucent; remove from the pot with a slotted spoon and set aside. Tie up the roast (if needed) and lightly flour the meat on all sides (keep extra flour to use later) Sear the roast in the bacon fat to brown evenly on all sides (use tongs to turn it, not a fork). Season with salt and pepper. Add the remaining flour into the pot and stir to incorporate and remove all lumps. 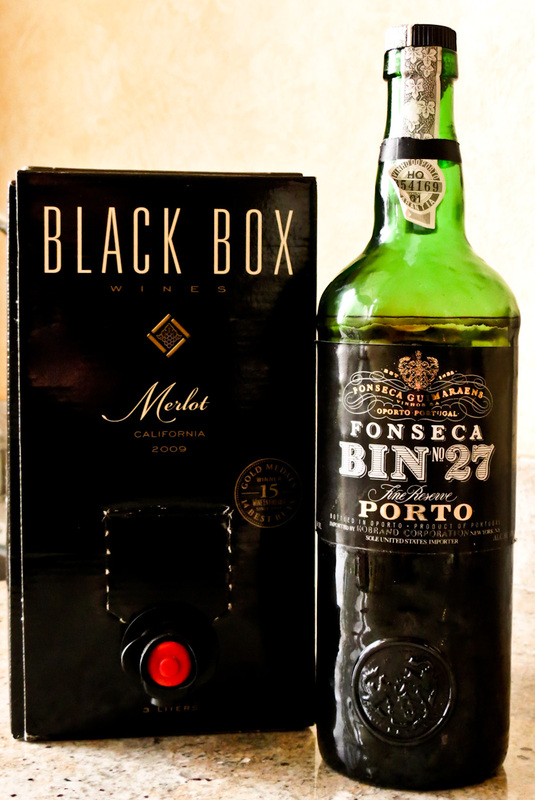 Add the Port (or Cognac) and stir to loosen all of the tasty bits in the bottom of the pot. Keep stirring to evaporate the alcohol. Add the wine, beef broth, tomato paste, seasonings and carrots (optional) to the pot: stir to incorporate. Return the onions to the pot and bring everything up to a simmer. Cook until the liquid begins to thicken and become more sauce-like, about 15 minutes. Cover the pot and place in a preheated 325 F oven to simmer for 90 minutes. Check the pot occasionally to be sure the liquid is cooking at a slow simmer, not bubbling vigorously. Adjust the oven temperature as needed: low and slow is the plan. 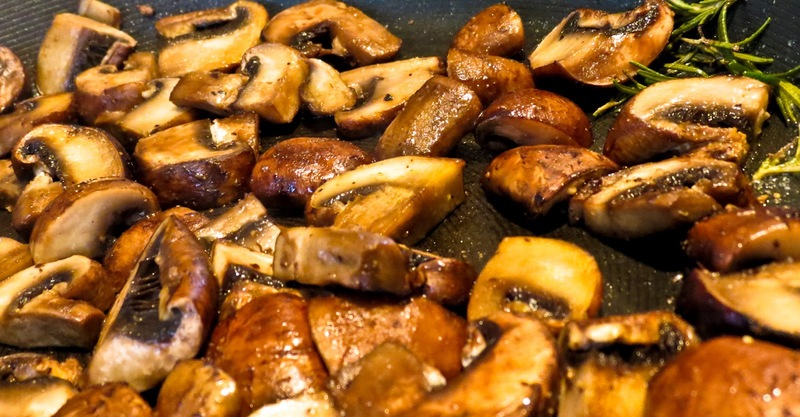 While the roast is simmering in the oven, prepare the mushrooms on the stovetop. Wipe the mushrooms clean with a dampened paper towel and cut from top to bottom into thick slices, about 4 or 5 per 'shroom. 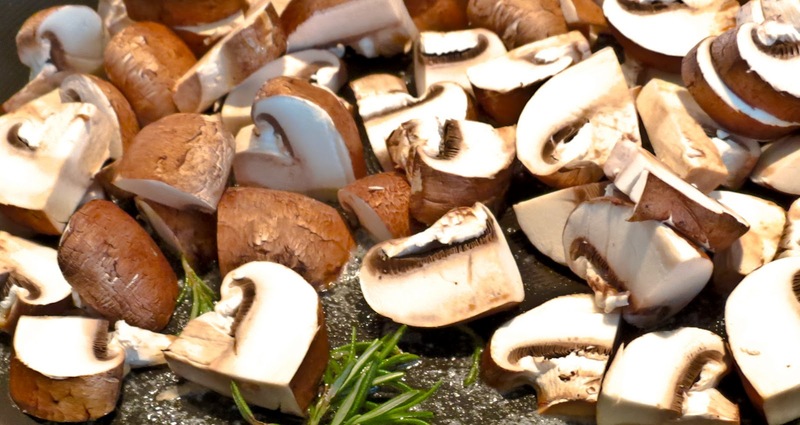 Melt the butter in a wide skillet; add the rosemary and mushroom slices and cook over low heat until the mushrooms give up their liquid. Cook down until the liquid evaporates; remove from the heat and set aside. Uncover the pot and test the meat for tenderness. If fork-tender, almost fall-apart done, remove the meat from the pot and keep warm. Turn up the heat a bit and simmer the liquid until slightly thickened; taste for seasonings and adjust salt and pepper as needed. Return the meat to the pot, add the mushrooms and peas (if using) and warm through. Top with desired garnishes, serve and enjoy. I had spent hours working on a project this morning when suddenly it was late afternoon and I was starving. Not literally, but breakfast was hours ago and my stomach growled noisily. The refrigerator yielded interesting odds and ends, but nothing substantial by itself. 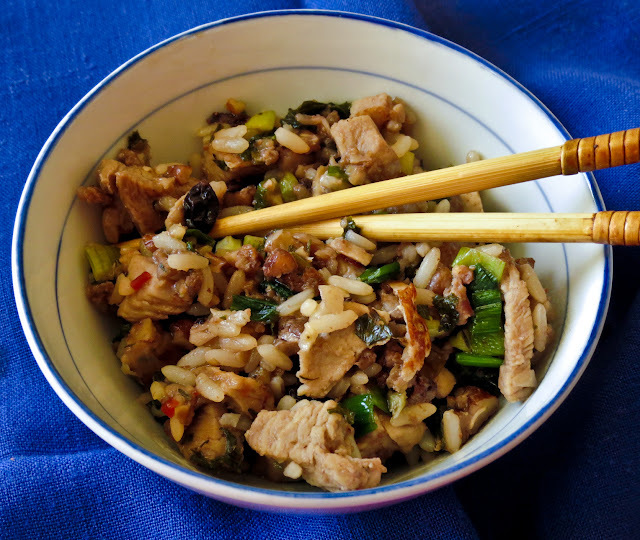 No problem, when heated together those interesting ingredients resulted in a dish somewhere between Pork Fried Rice and a Stir Fry of Pork and Rice. Finished with a splash of Thai Sweet Red Chili Sauce, lunch was delicious no matter what I called it. Leftovers-for-Lunch can be challenging, but today it was just delicious. Heated through and served, topped with a small handful of sliced almonds. 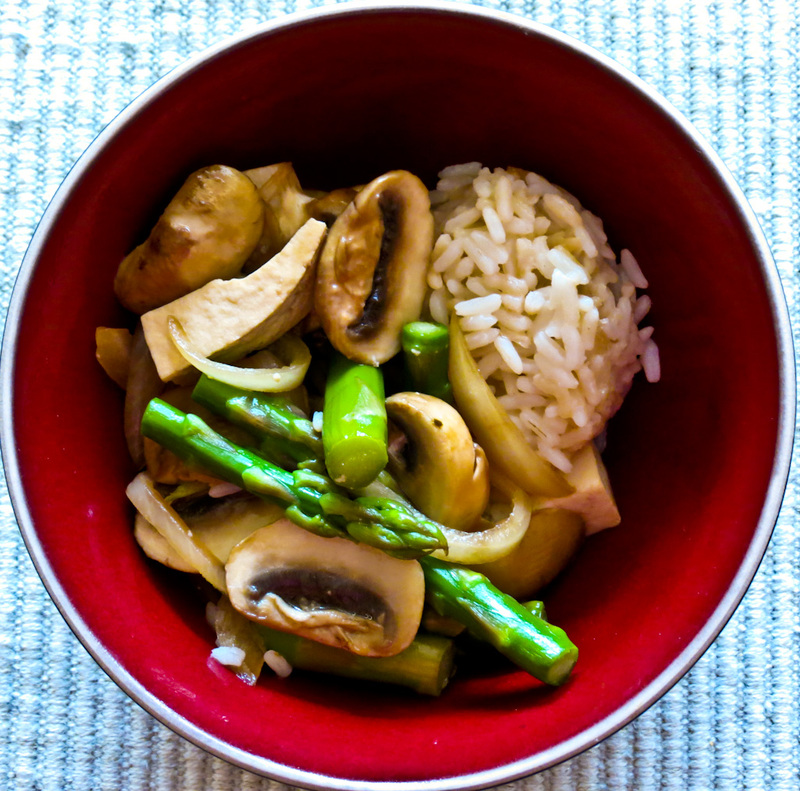 A quick stir fry sounded good, asparagus paired with mushrooms and tofu would be a healthy one-pot treat. Add onions, garlic, fresh ginger and an Asian sauce for flavor and presto! there's a fast and easy entree. Oyster sauce sat on the top fridge shelf, almost wiggling in wild enthusiasm and calling out "Choose me, choose me!" - almost. Oh yes, I know that flavor well. Just show me a bottle of oyster sauce and I immediately think of Broccoli Beef, its distinctive taste a strong food memory. That dish was one of our standard orders at Chinese restaurants for a lot of years. Any sauce that stands up to the assertive flavor of broccoli should work well with asparagus. Add oyster sauce to the ingredient list for this stir fry. It sounded promising, but lately my stir fry dishes all seemed to taste the same - adequate but boring. There was a clue that it was time to revisit both procedure and seasonings. I turned to one of my favorite blogs for inspiration, a return to basics and a fresh start on stir frying. 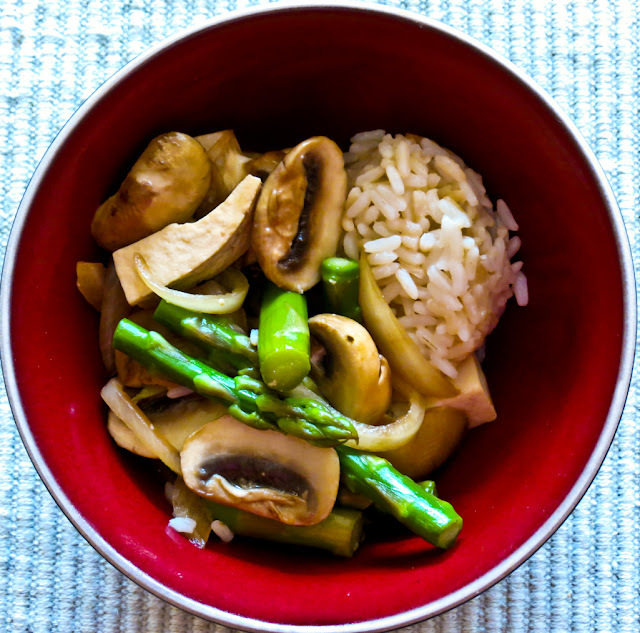 Click on SteamyKitchen's recent post for an instructive photo course in Stir Fry 101. I used that technique for this dish, but adjusted the ingredients to fit what was available in my refrigerator. There's another reason to love a stir fry, it's so flexible. 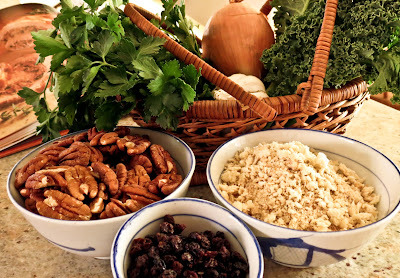 Fast - easy - flexible - what more can you ask of a tasty and healthy dish? 1. Add ½ cup water to a wok or saute pan. Bring to a boil and then add the asparagus. Cover and let steam for 2-3 minutes or until just barely tender. Drain the beans and set aside. Dry the pan and return to the stove. 2. Heat the wok over high heat and swirl in the cooking oil. 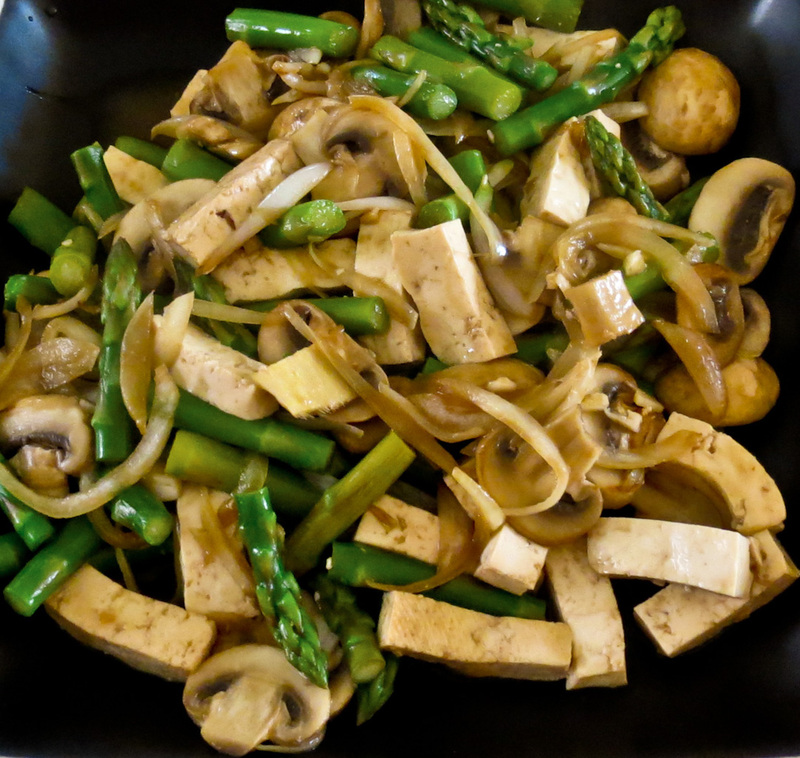 When the oil is shimmering, add the onions and mushrooms and stir fry for 3 minutes. Reduce the heat to medium and add the cooked asparagus, tofu chunks, ginger and garlic. Vigorously stir fry for 30 seconds more or until fragrant. Do not burn the ginger or garlic (or you’ll totally mess up the flavor). 3. Add the oyster sauce and water. Cook for 1 minute, tossing and stirring to coat all of the ingredients. Serve immediately, accompanied with a side of rice. The afternoon was supposed to be Cooking Chicken 101, the first installment on a gift coupon. Official cooking lessons? maybe, but it felt more like hanging out with friends in the kitchen. Hilary had requested we begin with different cooking preps for chicken. Easy enough I thought, I have a gazillion chicken recipes. The sheer abundance of recipes presented a problem: what to choose? how much to try in one afternoon? Time to refocus on methods and not just recipes. 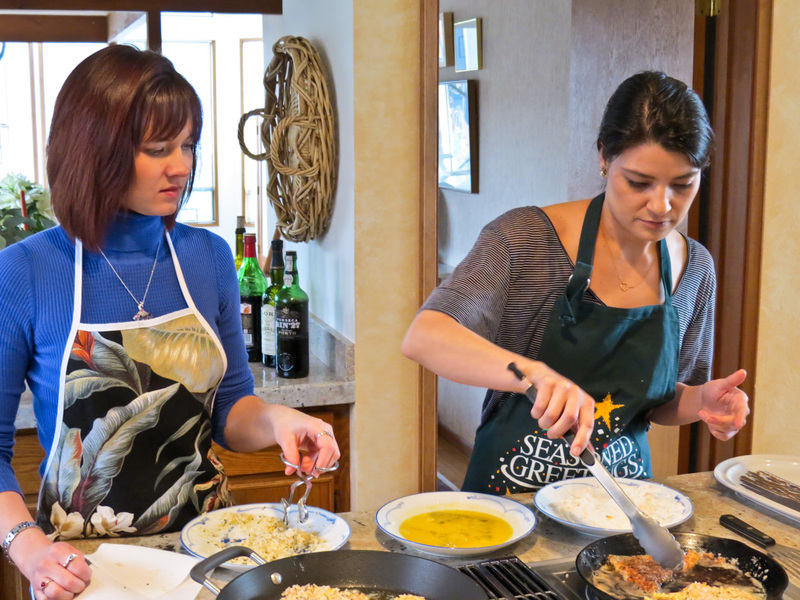 We began with a Pine Nut and Parmesan Crusted Lemon Chicken Scallopini (link). That introduced the girls to prepping the chicken breasts, the 3-step breading process and a quick stovetop sauté. Hilary and Chelsea whipped through this recipe like professionals. Two frying pans sizzled, the kitchen smelled heavenly and the four of us declared this recipe a keeper. Four? oh yes, RL was an eager taste-tester along with the kitchen crew. We shared the chicken breasts, nibbled on a pasta salad and some fresh grapes and headed back to work. Next up was Chicken Piccata. It began with the same technique for chicken breast slicing and pounding, skipped the breading, and moved on to a quick sauté. The focus here was on creating a pan sauce. Note the bottles in the background of the photo above - we sampled several beverages to select just two for different sauces. The vermouth-based sauce won out over the white wine sauce, but both chicken dishes were tasty. We might revisit pan sauces again with different aromatics and liquids. The third recipe was baked Mustard and Maple Syrup-Coated Chicken Thighs (link). Skinning and de-fatting the thighs took some time but the dish went together easily enough. This recipe called for 45 minutes in the oven, followed by a 3-minute broil to crisp up the topping. It smelled inviting, but by this time we were all too full for one more plate of chicken. I'll wait for a tasting report from the girls. Oh my goodness chicken dish #3 was surprisingly delightful! We got home from a long and hard first day back on the job to find our dinner awaiting us. We gave the dish a quick micro and broiled it for a few minutes (though we think we may need to play with this feature on our oven a bit because it didn't quite crisp up as we'd hoped) ...and 'voila!' a yummy homemade dinner and much needed alternative to Mr. Lean Cuisine was on our table. What surprised us most was how well the flavors worked together...a perfect combination of sweet and salty! We did find the bone a little tough to work around, since we were wanting to just gobble all of the deliciousness down! So, when we try this recipe again (which we most definitely will! ), we will probably go with boneless, or maybe a breast? Oh what fun we both had with you yesterday! We can't wait to do it again soon! All we talk about is food now, and what the next session may bring! I eat most things porcine, well, not so much the odd bits like pigs feet or pork snout, and certainly not pork rinds or chittlins... I love bacon and enjoy the commonly found cuts of pork like chops, ribs, steaks and roasts, but those #*@*#@* annoying Geico pig commercials are enough to turn me against pork completely... almost. Over and over and over the television screen fills with Maxwell the Pig zooming along on a zip line, or racing downhill on a street luge, or lately joyriding in a car with a posse of pigs on the loose, all the while crying wheeeeeeeee! I calm myself by envisioning that irritating critter as mobile bacon, ribs, chops and ribs instead… and hit the mute button on the TV remote. Click! take that little piggy! Wheeeeeeeeeee, indeed. 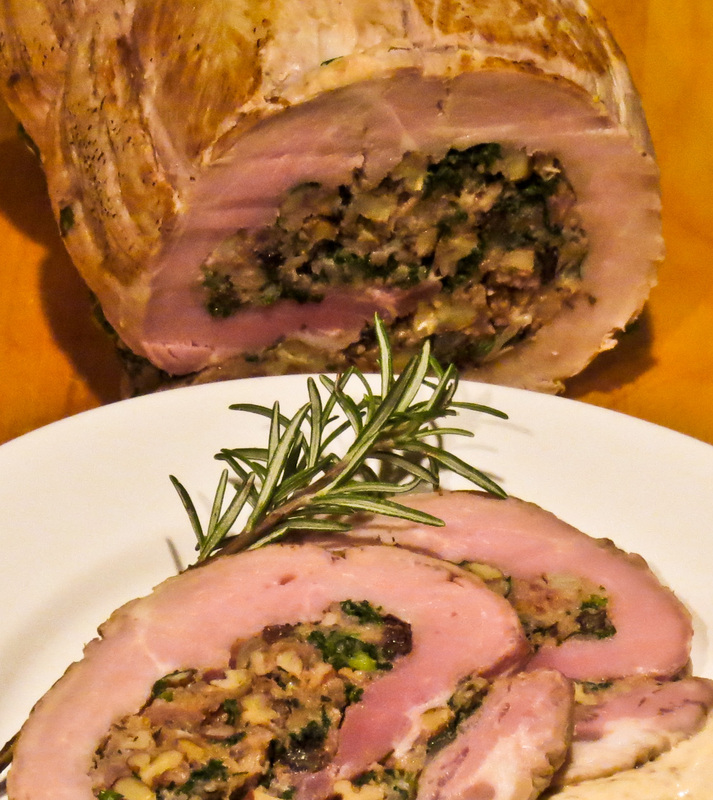 This recipe for rolled and roasted pork loin has erased any television generated anti-pork feelings. The meat is succulent, it’s crunchy pecan stuffing alone rates 5 stars, and the mellow tang of the creamy mustard sauce takes this dish over the top. Oh yes, we love this delicious stuffed, rolled pork loin roast. It requires a bit more prep time than usual for a weeknight meal, but is easy to prepare and looks impressive enough to serve to company. 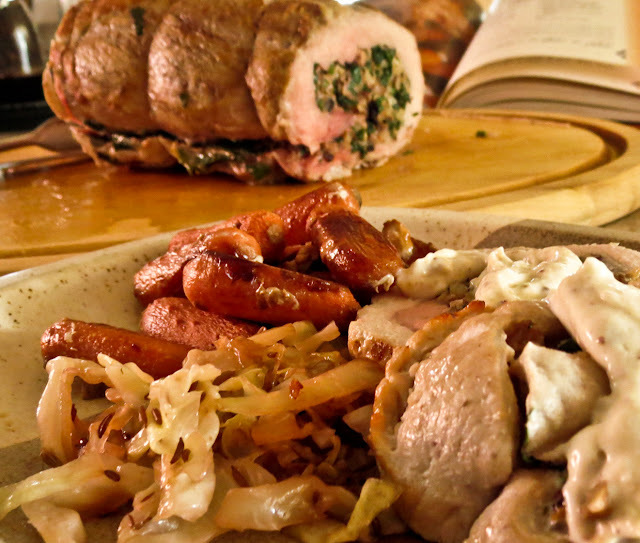 Photo: Pork pinwheel with sauce, roasted carrots and braised cabbage slaw. Begin by whizzing up a cup of bread crumbs (about 2 thick slices). Gather up the remaining stuffing ingredients; mix together and set aside. 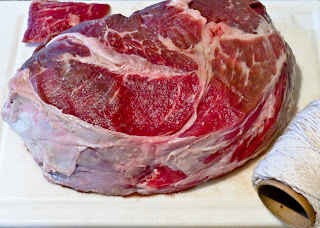 Trim the excess fat off the roast, slice to open in half, then open each half again. Pound the roast to an even thickness, careful not to tear or separate the sections. Spread the stuffing evenly across the butterflied meat; press firmly in place. 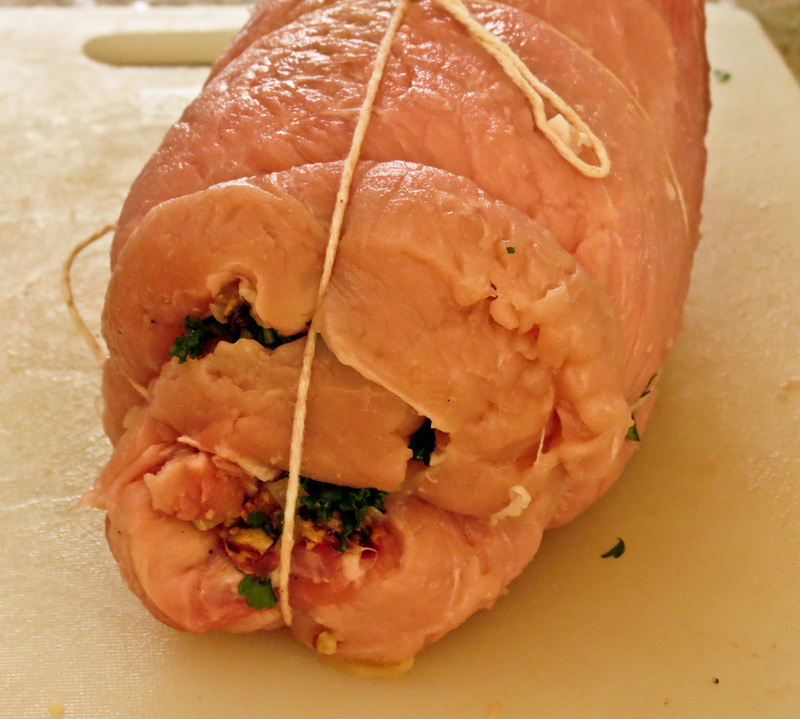 Roll up, beginning with a short side, and tie securely with kitchen twine. Brown well on all four long sides and pop into a preheated 325 F oven. 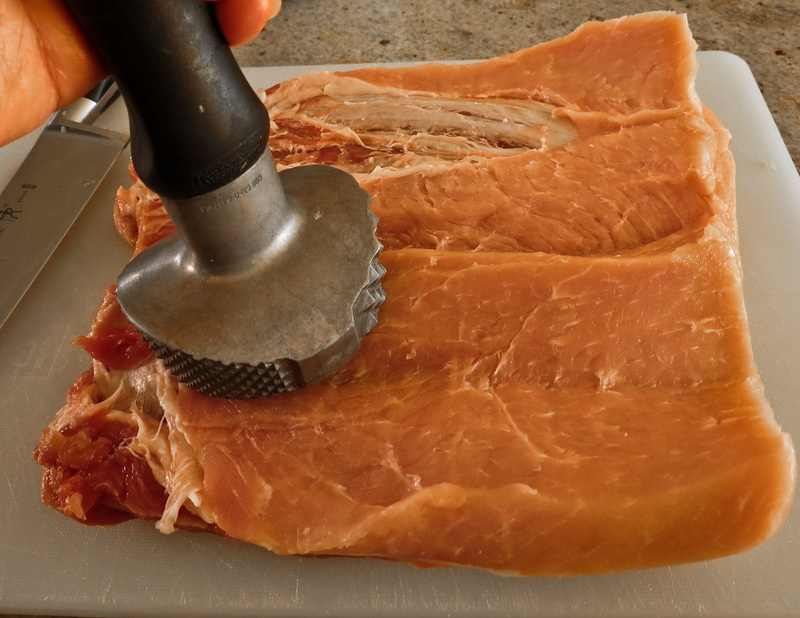 Remove when internal temperature reaches 150 F; let rest 3 or 4 minutes before slicing. Serve warm from the oven or cool and chill to serve cold slices later. These pork pinwheels are delicious served with a cooked Creamy Mustard Sauce or a quick cold mustard/mayonnaise/horseradish sauce. *Extra stuffing? use it to make Stuffin Muffins, a treat all by themselves. Still with me? here's the official recipe with just a few notes. Heat 1 tablespoon of the olive oil in a medium sauté pan over high heat until very hot. Add the garlic and onion and lightly sauté for about 2 minutes. Let the mixture cool, then place it in a medium bowl. Add the pecans and breadcrumbs to the onions and mix well. Wilt the kale in the same sauté pan for a minute or two, then add it to the bowl. Toss in the parsley, rosemary and currants; pour in the chicken stock and mix well. Add the crumbled, raw sausage, thyme and mustard powder; mix together. Add some salt and pepper. 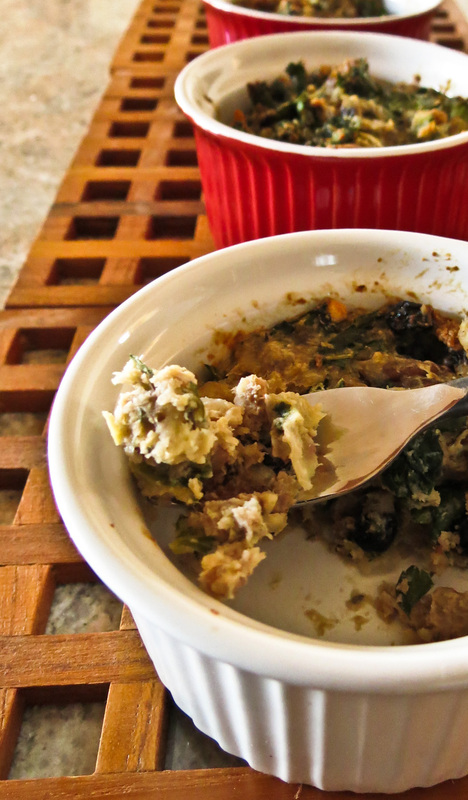 Form a tablespoon of stuffing into a tiny patty and cook it in the sauté pan. Taste for seasoning; adjust as needed. Butterfly the pork roast, cutting the top side carefully along the length until you are about ¼ inch from the bottom side (do NOT cut all the way through, you want the halves to stay securely attached.) Open the roast like a book and repeat the butterfly cut with each side portion, slicing from the inside edge to ¼ inch from the outside edge of each piece. Open these sections outward (you will have 4 long pieces of equal size). 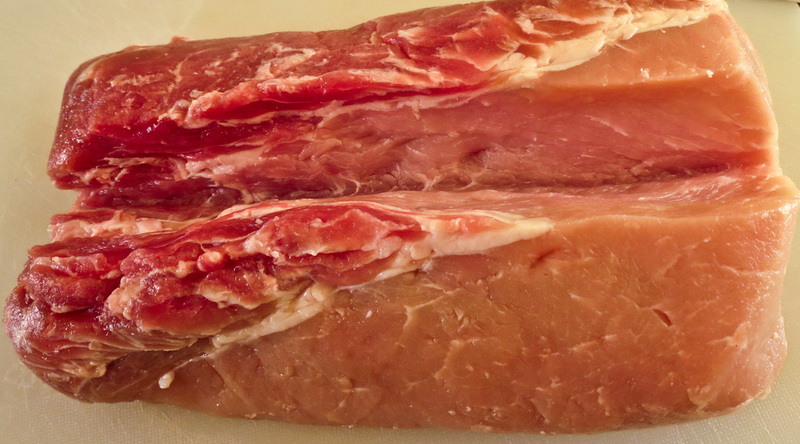 Place the meat on a sturdy work surface, cover with a large sheet of plastic wrap and pound with the smooth side of a meat mallet to evenly flatten out the roast (be careful not to pull the sections apart). 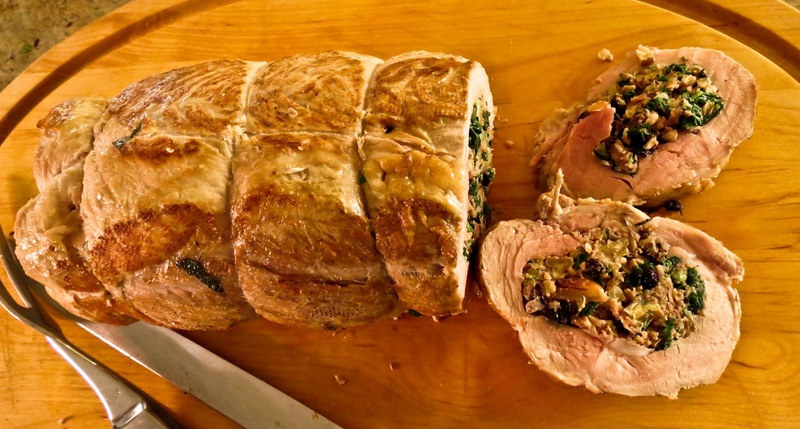 Spread the filling evenly on the meat (you may have some extra*), roll the roast jelly-roll style, and tie securely with kitchen twine in several places. Preheat the oven to 325 F. Heat the remaining tablespoon of olive oil over high heat in a large ovenproof sauté pan until the oil shimmers, not quite smoking hot. Sear the rolled, stuffed pork well on all 4 long sides, about 5 or 6 minutes total. At this point I toss a handful of mini-carrots into the pan and position the roast on top of them; they work well as a rack and are quite tasty as a side dish. Place the pan in the oven and roast the pork slowly about 40 minutes, or until an instant-read thermometer reads 150 F.
*That extra stuffing I mentioned above – add a beaten egg to the mix as a binder and fill a few ramekins or muffin cups to bake alongside the roast. These stuffin’ muffins are delicious on their own! 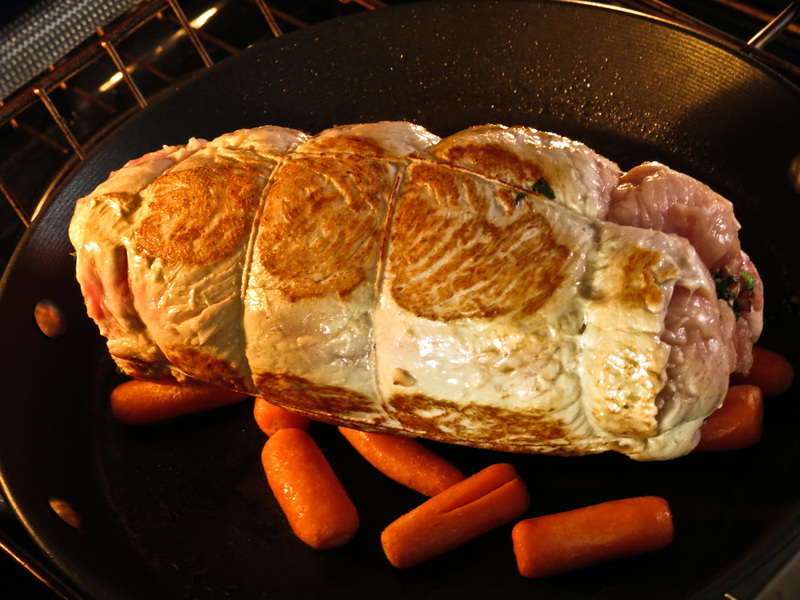 Remove the roast from the oven and let it rest for about 3 minutes before slicing. Cut the twine and remove from the roast. 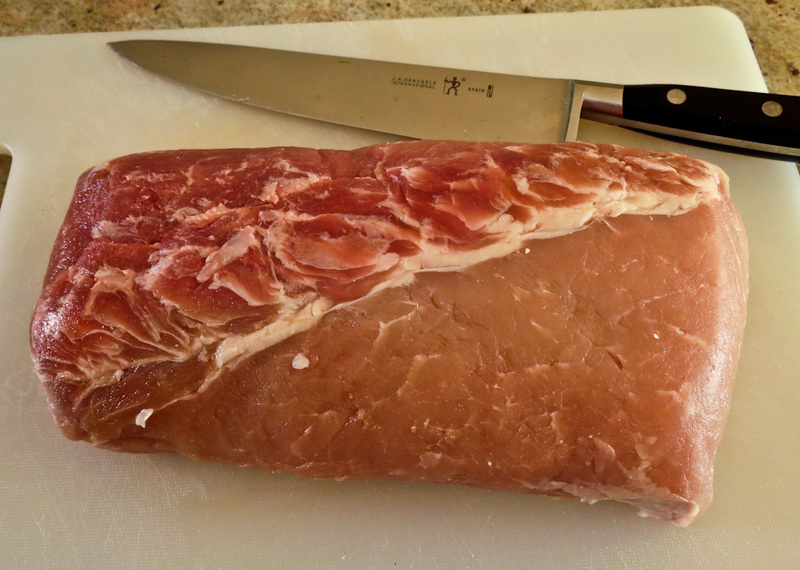 Slice the pork ¼ inch thick and place the slices on a serving platter or on individual plates. Drizzle the sauce over the slice and serve hot. 1. For a quick, cold sauce mix together mayonnaise, grainy mustard and creamy horseradish in a 3:2:1 ratio; thin as needed with milk or half and half. 2. This pork dish makes an impressive presentation on a platter as well as plated individually. Accompany with sweet and sour braised cabbage, roasted winter vegetables and a salad of mixed greens tossed with a warm vinaigrette, crisped pancetta, roasted grape tomatoes and green beans.